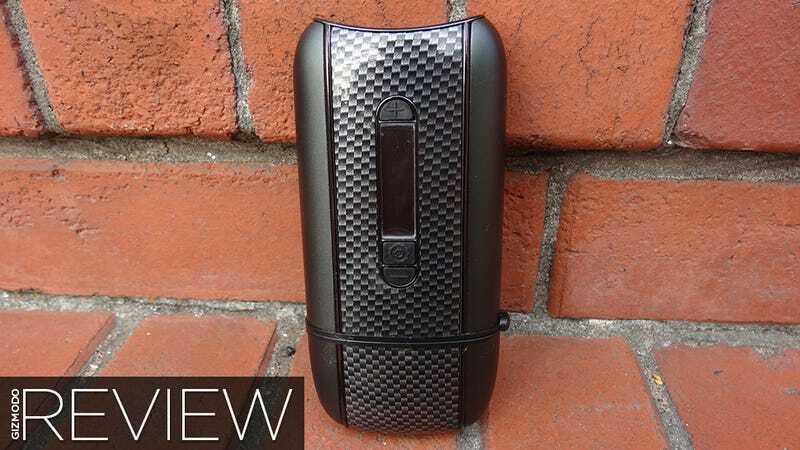 The Pax and the Firefly are both fantastic vaporizers, but they suffer from the same shortfall: neither can handle anything other than loose-leaf material. Try to vape a concentrate or essential oil and you'll be spending the rest of your evening de-gooifying your equipment. Not so with Da Vinci's latest portable offering. A discrete portable vaporizer equally capable of handling concentrates and loose leaf plant matter alike. Most vapes can only handle one or the other—either they're concentrate pens or loose-leaf vaporizers like the PAX or the Firefly. Even the most basic $5 bodega glassware is capable of burning both loose leaf and concentrate; why shouldn't your vaporizer? It's about the size of a Star Trek communicator, roughly two iPhones stacked atop one another. The front face features an OLED display that shows the unit's current temperature (which ranges from 38 to 430 degrees F) as well as the unit's menu button and temperature controls. The Ascent is available with a carbon fiber accent (as the review unit has) as well as burl wood and straight black. A retractable glass mouthpiece pulls out from the top of the unit, next to the power button and integrated stainless steel poker. The vapor pathway is all glass, which better preserves the vapor's flavor and doesn't impart the horrid plasticky taste that the last Da Vinci we tested did. The lower third of the unit swings 180 degrees open to reveal the heating chamber. To handle both types of material, the Ascent relies on a glass insert (two are included) to hold concentrates, waxes, and oils while loose leaf can simply be ground and stuffed into the heating chamber itself. Flip out the heating chamber and either insert your loose-leaf directly or fill an insert halfway with concentrate, cover with the reusable rubber lid and drop that into the chamber. Shut the heating chamber, turn on the Ascent, and wait for it to heat to your desired temperature. The unit heats up in about half a minute and dutifully maintains a 5-10 degree range around the target temperature as you draw. The Ascent demands a deliberately slow and steady draw to get the most out of each bowl. Though it doesn't produce the same volume of milky vapor as the Pax and Firefly, the Ascent definitely delivers the same user experience. This unit takes about five hours to fully charge from a dead stop, nearly double what the Firefly requires and more than an hour than what the Pax does, but can endure three or four full sessions before dying again. The Ascent's versatility is a huge plus, especially for herb connoisseurs and legitimate medical marijuana patients in need of a more intense high without resorting to dabbing or baking. Plus, the user-set temperature feature allows a far greater degree of control over the vaping experience than what the Pax and Firefly can deliver. Holy schamoley, everything gets sticky. The rubber vial covers are supposed to keep hot concentrates from being drawn up the vapor pathway. They don't. A single session with bubble hash was enough to not only jam the vial in the heating chamber but also jam the entire swing-out loading mechanism and leave the back of my teeth slick with resin. Luckily, a quick heating (up to about 120 degrees) was enough to loosen the hash's grip and the included secondary mouthpiece can cut down on the amount of hash you eat instead of vape, but you'll want to keep a bottle of rubbing alcohol and some Q-tips at the ready after each session. Loose leaf vaping, on the other hand, should only require occasional cleanings.